Angela Barbalce's "White Dress" (pencil and watercolor on paper) received a Mercer County Purchase Award. 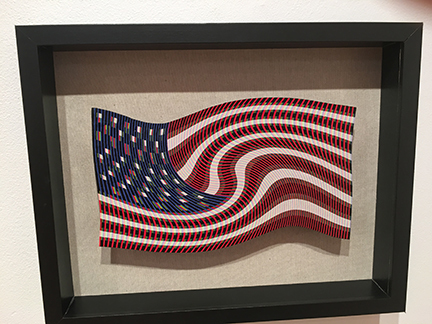 "Wavy RGB Flag" by Chris Cooper (oil on paper) received a Mercer County Purchase Award. 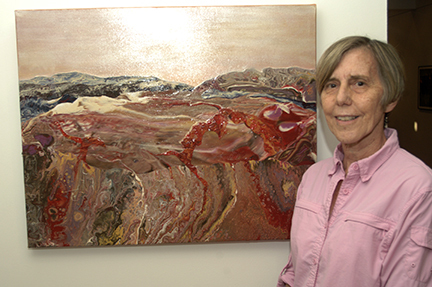 Susan Gilli received a Mercer County Purchase Award for her mixed media artwork, "La Moraine." 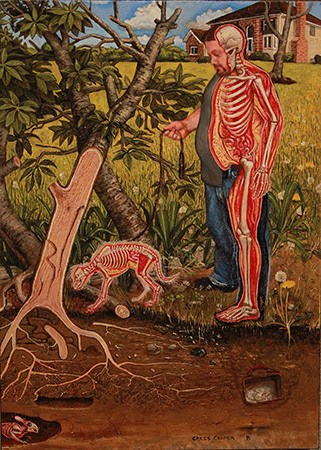 "Self-Portrait" by Chris Cooper (oil on board) received the Juror's Best in Show Award. "The Waffle House" by Sheryl Bassman (pen and acrylic on canvas) received the West Windsor Arts Council Award. WEST WINDSOR – Artists and art lovers alike came together at the Gallery at Mercer County College (MCCC) on May 23, as award winners for "Mercer County Artists 2018" were announced. "The Mercer County Artists show is a great opportunity to showcase our artist community, and celebrate what you do," said Lucas Kelly, director of the MCCC Gallery and a professor of Fine Arts at the college, to the artists in attendance. 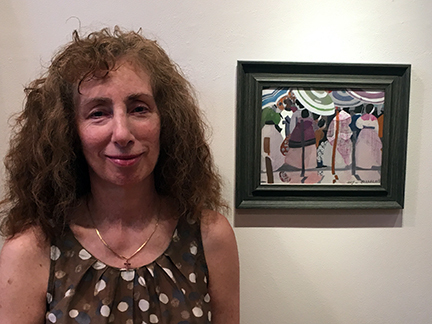 The talents of 21 Mercer County artists, featuring 28 works in a variety of media, will be on display at the Gallery through Monday, July 9. The MCCC Gallery is located on the second floor of the Communications Building on the college’s West Windsor Campus, 1200 Old Trenton Road. During the May 16 opening reception, more than $1,000 in prizes were announced, including the "Blick Art Supplies Best in Show," plus multiple Purchase Awards from the Mercer County Cultural and Heritage Commission. Artwork selected for Purchase Awards will be added to the county's permanent collection. In addition to Kelly, award presenters included Tricia Fagan of the Mercer County Cultural and Heritage Commission and a representative of the West Windsor Arts Council. The Best in Show prize was awarded to Chris Cooper of Lawrenceville for his work "Self Portrait," an oil on board painting. 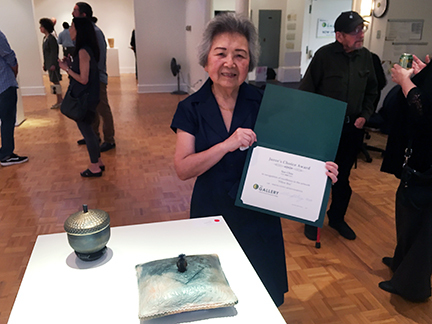 Sue Chiu of Lawrenceville received the Juror's Choice Award for her clay sculpture "Pillow Box," with Phillip Cox Luth, Princeton, receiving an honorable mention for his collage "Color Comp 102." Cooper also received a Mercer County Purchase Award for his oil on paper work, "Wavy RGB Flag," as did Susan Gilli, Hamilton, for her mixed media artwork "La Moraine." The third Purchase Award went to Angela Barbalace, Hamilton, for her pencil and watercolor "White Dress." 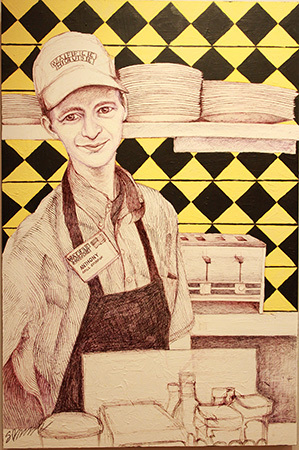 The West Windsor Arts Council Award went to Sheryl Bassman of Robbinsville for her ball point pen and acrylic work "The Waffle House." Other featured artists are: Louis Cicchini of Princeton Junction, Ingrid Davis of East Windsor, James Doherty of Lawrence, Julie Fox of Princeton, Jamie Greenfield of Lawrenceville, Katarzyna Iwaniec of Princeton Junction, William Knight of Burlington, Suzanne Migliori of Groveville, Janis Purcell of East Windsor, Libby Ramage of Princeton, Robin Robinson of Trenton, Jules Schaeffer of Belle Mead, Janet Marion Simmons of Princeton, Larry Steele of Lawrenceville, and Susan Winter of Hightstown. Prior to the presentation, Lucas told artists that this year’s juror, Alexis Nutini, was very deliberate in his selections, and while shows in past years may have included more pieces, he remained focused on presenting a cohesive presentation. "He wanted to give you the most professional show he could, and give you the best opportunity to showcase your work," Kelly said.